A secularist group has lodged an official complaint against Cherie Booth QC after she spared a man from prison because he was religious. Shamso Miah, 25, of Redbridge, east London, broke a man's jaw following a row in a bank queue. 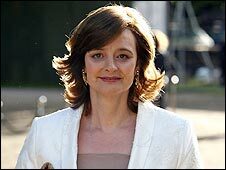 Sitting as a judge, Ms Booth - wife of former Prime Minister Tony Blair - said she would suspend his sentence on the basis of his religious belief. The National Secular Society claims her attitude was discriminatory and unjust. Inner London Crown Court heard that Miah, 25, of Redbridge, east London, went into a bank in East Ham and became embroiled in a dispute with Mohammed Furcan about who was next in the queue. Miah - who had just been to a mosque - punched Mr Furcan inside the bank, and again outside the building. Ms Booth told Miah that violence had to be taken seriously, but said she would suspend his prison sentence because he was a religious person and had not been in trouble before. She added: "You are a religious man and you know this is not acceptable behaviour." The National Secular Society has complained to the Office for Judicial Complaints, suggesting that Mrs Blair acted in an unjust and discriminatory way, and suggesting that she might have treated a non-religious person less leniently.